The 21st and Shotwell intersection will be getting new streetlights and crosswalks in the next few months, according to Sandra Zuniga of the city’s “Fix-It” team. PG&E will be installing four new streetlights at the corner of 20th and Shotwell, and the SFMTA is recommending the installation of more prominent crosswalks. Zuniga said she also requested more street lighting at the corner of 21st and Shotwell, near Jose Coronado Playground. “This is the beginning of more improvements coming to these intersections in the next few months,” Zuniga wrote in an email to residents of the area. The improvements are part of a broader effort to “fix” the area surrounding Jose Coronado Playground, where residents have complained about loitering, homeless encampments and prostitution. The Community Music Center has a new executive director. Julie Rulyak, previously the executive director of the Turtle Bay Music School in New York City, will be taking over the post. The Music Center hired Rulyak after a national search. Rulyak has a background in fundraising and institutional advancement, and she holds a B.M. and M.A. from New York University’s Steinhardt School for Culture, Education and Human Development. 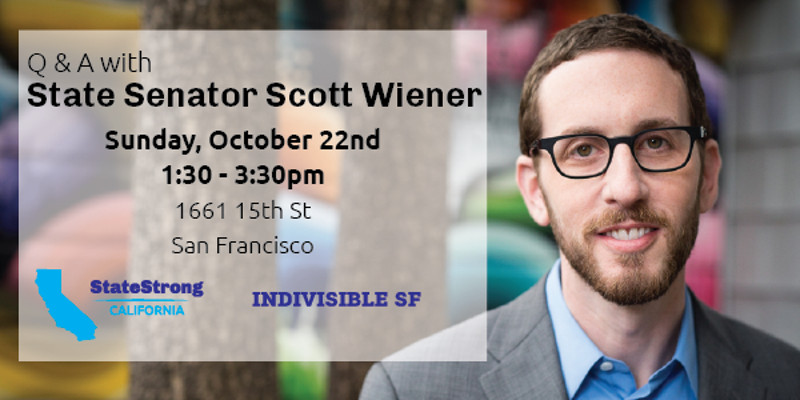 Got questions for Sen. Scott Weiner? Glass at Dolores Park has been an ongoing problem, and the Dolores Park Ambassadors want you to know there are alternatives. Support the park advocacy group on their Day without Glass in the Park on Saturday, Nov. 4 from 12 p.m. to 4 p.m. Of course, you could be a good citizen and start this weekend. Are you a Bay Area filmmaker with a short film to showcase? The Roxie is now taking submissions to be part of a mini-festival for mini-films, its fourth annual Mixtape. The cultural center’s Day of the Dead exhibition opened Oct. 10 and closes Nov. 17, with a celebration Nov. 2. Too bad this corporatist Weiner defeated the great progressive Jane Kim in the State Senate election last year.